A rendering of West Oakland's upcoming grocery store. Years in the works, a full-service grocery store is finally being built in West Oakland. Community Foods Market, formerly called the People’s Community Market, broke ground last Friday and is slated to open in October. 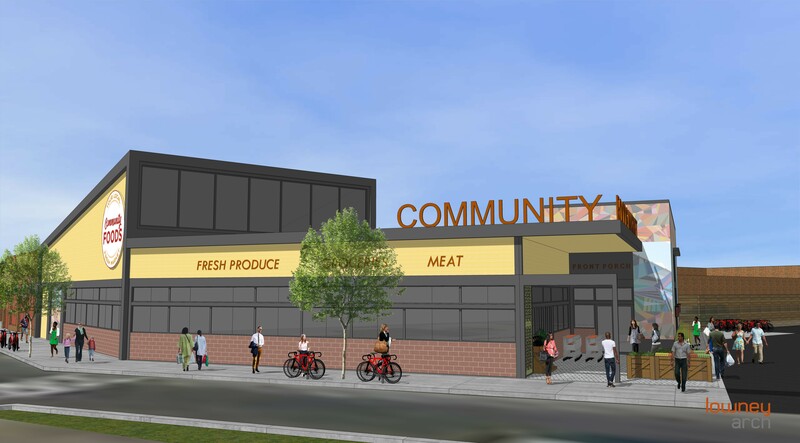 The 14,000-square foot space — about half the size of a traditional supermarket — is being built in a neighborhood long considered to be a food desert. The space, on the 31st block of San Pablo Avenue, was previously a granite and tile warehouse, and before that, a Harley Davidson shop built in the ’40s. The old building has now been razed to the ground. 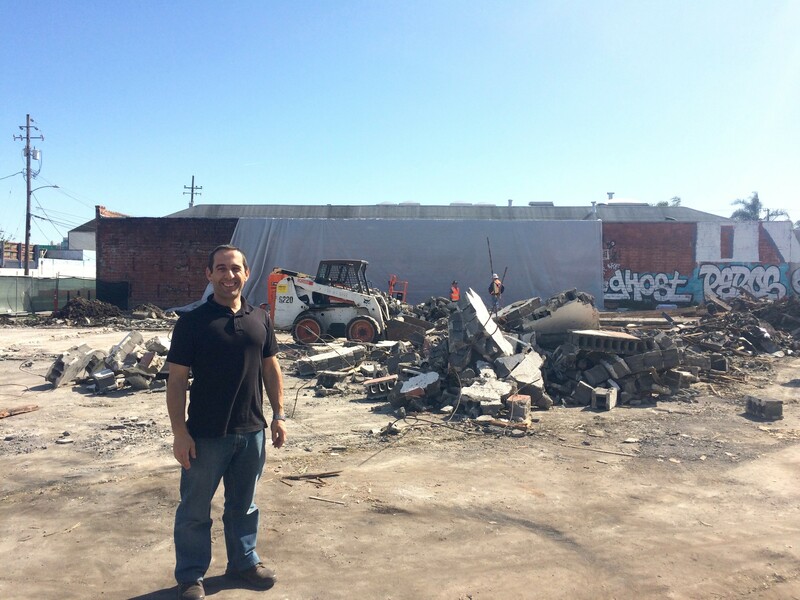 Standing in front of the construction site last week, Brahm Ahmadi, who is helming the project, said that community members are excited about the new market. On Saturday from 11 a.m. to 2 p.m., Ohlone, African American, and Mexican American elders will bless the space, and community members are invited to plant beads in the ground to represent their wishes for the market. “I want to start with a sense of clarity and purpose,” Ahmadi said. Ahmadi, who co-founded the People’s Grocery in 2002, had experimented over the years with a mobile market, largely run by local youth, as well as agricultural development. But for all those years, Ahmadi says West Oakland residents just wanted a grocery store. “It was always the dream,” he said. Brahm Ahmadi at the site of Community Foods Market. A market study showed that West Oakland residents spend about $60 million on groceries, and that 70 percent of that money is spent outside of Oakland. There were offers for other places in former warehouses for the market, but they were in locations that were less friendly to locals who may rely on public transit or have mobility issues. “A smaller footprint is what works for a neighborhood shop,” Ahmadi said. “We could’ve built in a warehouse years ago, but who can get to that who doesn’t have a car?” The current location at 3105 San Pablo Ave. is within a half-mile distance from about 9,000 residents. Access to healthy, affordable, and fresh food was most important, Ahmadi said. They hope to create 60 jobs once it’s up and running. The market will include a deli as well as the Front Porch Cafe and Social Hall with breakfast, lunch, and dinner service. The social hall will be a gathering place for community events such as live music and poetry readings. Down the line, Ahmadi hopes to partner with nonprofits and healthcare providers for health and nutrition services, such as offering diabetes screenings. He also hopes to include classes for seniors, many of whom live along the San Pablo corridor. Ahmadi said he was careful about taking on this project, his first big grocery venture, since he is already invested in the community and wants it to succeed. “If it doesn’t succeed, the community gets blamed for it,” he said. Community Foods Market is currently leasing the land from Oakland-based East Bay Asian Local Development Corporation.